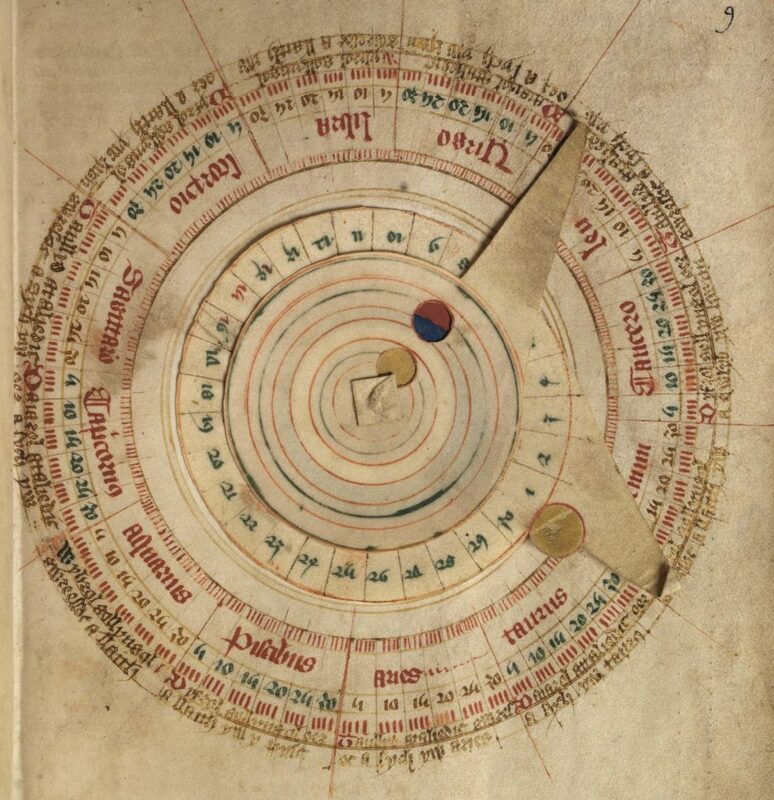 ‘Volvella’ of the moon, with moveable device for calculating the position of the sun and moon in the zodiac. Back in July 2014 I posted about volvelles (LINK HERE)- manuscripts, and later printed books – which incorporated designs or texts over which moving dials or pointers were fixed, enabling the user to calculate or combine pieces of information in the text, for example for computing astronomical or astrological charts. Ramon Lull is usually credited with inventing this ‘ars combinatoria’. My post went on to consider other kinds of combinatorial text, from Swift’s Lagado machine in Gulliver’s Travels, to Borges. I also linked to related posts about, among others, Calvino, OuLiPo, Permutational Poetry, and so on. I’ve just come across a post from the iris website – the Art and Archives blog of the J. Paul Getty Museum in Los Angeles – by Rheagan Martin: ‘Decoding the Medieval Volvelle’, dated 23 July 2015. This post, like mine, gives historical context to the phenomenon of volvelles, and includes some lovely images, with links to the exhibition which ran that year, and to zoomable illustrations from books that were in it. I recommend you take a look at it – and, I hope, back at my original volvelles piece. This entry was posted in Literature and tagged ars combinatoria, codicology, Getty Museum, Ramon Lull, Volvelles by Simon Lavery. Bookmark the permalink. Rats! How did I miss that exhibit? And I’m so close to the Getty. I should get on their email lists so I don’t miss other ones. It would have been great to see these volvelles in the flesh, as it were. It really is quite moving to see original texts. I always like to duck into the Library when I’m at the Huntington, if I’m not too exhausted from the gardens. Paula- how great to live so close to these places. Btw, I haven’t heard anyone say ‘rats’ in a long time! Hi Simon, and hello, fellow Lavery Afficianado Paula ; ) ! Yes, would love to get to the Getty someday. California is such a magical place, the coastal highways, LA, San Francisco… Simon, I am not sure if you have made it as far as the West Coast, but if not, recommend highly. You can even rent a cool car in Arizona (maybe in early spring) and drive Route 66 all the way there. Paula, in 1981, I took a Greyhound from San Francisco to LA for the weekend. It was a very hungry trip, since I had very little cash, and someone from the group home I was living at stole my fried chicken picnic I was going to eat and I had to make do with a bag of peanuts. To distract myself from my hungry stomach (and the guy sleeping on my shoulder) I spent the trip reading “The Big Nowhere” by James Ellroy, set in noirish 40’s San Francisco. I actually liked it better than “LA Confidential.” The bus dropped me off in the grittier side of Hollywood, and it was filled with punk rockers with great pointy hairdos. When I got my bus back to San Francisco around 7:30 a.m. on Sunday, the same punk rockers were stumbling home from the bars, looking the worse for wear! P.S. Simon, if you want to watch a really great visual snapshot of 80’s LA (and actually it is still not that much different) check out the 1982 remake of “Breathless” with Richard Gere. Great atmospherics, great music!